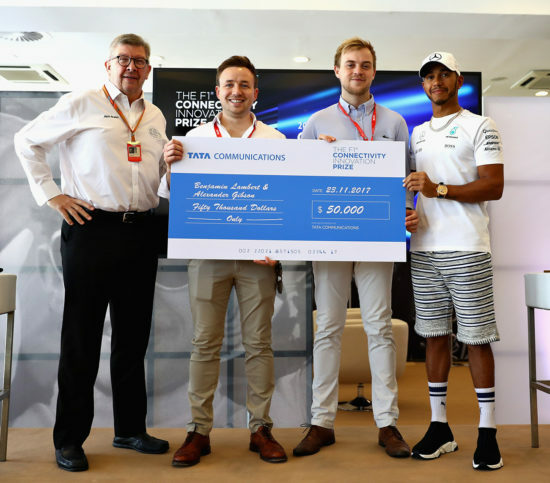 Tata Communications, the Official Connectivity Provider to Formula 1® and the Official Managed Connectivity Supplier of Mercedes-AMG Petronas Motorsport, has today unveiled Benjamin Lambert and Alexander Gibson from the United Kingdom (UK) as the grand prize winners of the 2017 F1® Connectivity Innovation Prize. During a ceremony in the run-up to the 2017 FORMULA 1 ETIHAD AIRWAYS ABU DHABI GRAND PRIX, four-time Formula One World Drivers’ Champion Lewis Hamilton handed the winners a cheque for USD $50,000 and a bespoke trophy. The best thing about this competition is that it gives the power to the fans – it’s a way for them to imagine what they’d want the sport to be like in the future and share their vision with us. Formula 1® racing, which began in 1950, is the world’s most prestigious motor racing competition and is the world’s most popular annual sporting series. In 2016 it was watched by 400 million unique television viewers from over 200 territories. The 2017 FIA Formula One World Championship™ runs from March to November and spans 20 races in 20 countries across five continents. Formula One World Championship Limited is part of Formula 1, and holds the exclusive commercial rights to the FIA Formula One World Championship™.